Constitution, formerly known as "Hitpoints", is the cradle of all Combat skills. Without Constitution, fighting an enemy or even having a quick spar with your friends at the Duel Arena would be impossible. This skill is responsible for the amount of Life Points you have. The higher your Life Points, the longer you can last in a fight against any kind of trouble you may face. By reading this guide, you will further understand the concept of Constitution, and learn how to sustain yourself and your health in the realm of Gielinor. Unlike the majority of skills in RuneScape, Constitution is not leveled by performing tasks which pertain to the skill you are raising, rather, it is simultaneously trained by using any form of Combat. These skills include Attack, Defence, Magic, Ranged and Strength. It must be noted that Constitution is a skill that takes a little longer than other skills to level. To check the current level of your Constitution, click on your skills interface and hover over the box that has an image of a heart as shown below. Your skill level will be shown to the left of the heart. The unique thing about this skill is that there is a separate ratio between your skill level and your actual Life Points. Your Life Points are your skill level, times ten. An example is if you have level 70 Constitution, your Life Points will be 700. To find your Life Points, observe your mini-map at the top right corner of your game screen. To the left, you should find your life-points. Leveling your Constitution may be tedious at times. However, if trained to a considerable level, maintaining your health should be easy. Also, if you're looking to increase your combat, Constitution serves as 0.25 of a combat level. A successful attack on an opponent will result in an increase of Constitution experience. The experience is nearly equivalent to the amount of damage dealt from your attack. The ratio is 1.3 experience points for every 10 points of damage you accurately strike. Even though combat is the traditional way to rack up experience, there are other, more diverse ways to accumulate it. By completing several quests, minigames, miniquests, distractions & diversions, and random events, you may be awarded a nice chunk of experience. View the charts below to see which activities earn you the experience you desire. Varrock Museum 3x Antique Lamps giving 1,000 XP; 1x Antique Lamp giving 10,000 XP to a skill above 50. Tears of Guthix1 Varies by level. See the Tears of Guthix Calculator. Penguin Hide and Seek Varies by level. 1 Tears of Guthix will reward Constitution XP only if Constitution is your lowest-level skill. Picture yourself taking a stroll through the Wilderness when all of a sudden you find yourself amongst the nasty green dragons. Unfortunately, you've misplaced your anti-fire shield and forgot to compensate yourself with a new one, but decide to bear out the fight with the vicious dragon heading towards you. You take some Life Points away from it, but it decides to retaliate with it's fire breath. Consequently, you burn to death and find yourself at your respective respawn point several seconds later. Death is a natural part of roaming throughout Runescape. However, once you fall, you learn to strengthen up, and the amount of deaths that occur as you experience the game will grow less and less. Death is the state in which your player's Life Points reach zero. Under "normal" circumstances, a gravestone will appear where you died, and your character will respawn. 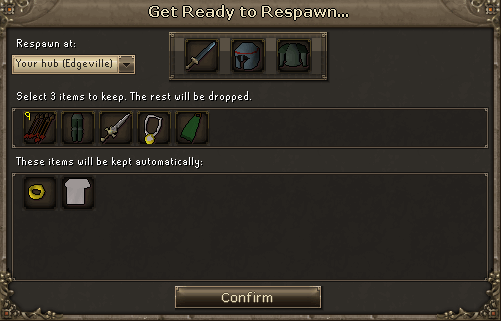 When a player dies, the respawn interface screen will appear, allowing the player to choose the items they wish to keep. Players may normally keep up to three items, and by default, these items will be the items with the highest Grand Exchange value. However, when a player is 'Skulled' -- which occurs when entering the Abyss, or after attacking another player in the Wilderness -- no items will be kept. The Protect Items Prayer (requires level 25 Prayer), when activated, allows players to keep an extra item on death, for a total of four items when not Skulled, and one item when Skulled. As you can see in the above picture, this player will keep a Rune Longsword, a Rune Med Helmet, and an Adamant Platebody. If you would prefer to keep a different item from the list, you may drag it over one of the currently 'kept' items to replace it. Falador: Complete the Recruitment Drive quest. Soul Wars: Complete the Nomad's Requiem quest. Camelot: Complete the Knight Waves Training Ground miniquest after the King's Ransom quest. Once you confirm your kept items and your respawn point, a gravestone will appear over your dropped items (the items that were not kept on death), and you will appear at your selected respawn location. You'll also notice a countdown timer below your minimap. Your dropped items will be protected until this timer runs out, after which time they will become visible to other players for one minute before disappearing forever. Other players can bless your gravestone and give you additional time to make it back and claim your items. If a player logs out, the gravestone will remain and the timer will continue to count down, but the gravestone cannot be blessed. In this case, you must log into the world you died on to reclaim your items. Your gravestone will not be found on any other world. 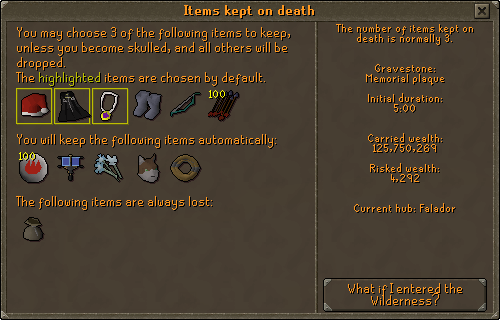 You can find out some useful information about the items you will keep on death by clicking on the 'Show Items Kept on Death' button in your equipment interface. You'll see the default items kept on death, as well as any items that will be lost or destroyed upon death (such as Runecrafting Pouches). Some items, such as runes, quest items, untradeable items, and low value items will always be kept. Other stats, such as your carried and risked wealth, as well as your gravestone type and duration, also appear on the right side of the screen. The exception to this is when a player dies in the Wilderness. In this case, the player will have no choice in which items are kept, and a gravestone will not appear. The player will respawn near the Edgeville bank with their three most valuable items (unless Skulled). Of course, there are "safe" areas in the game where players will not lose any items upon death. Any minigames that are safe, such as Castle Wars, Pest Control, Clan Wars or Soul Wars, will allow players to keep all of their items on death. Other safe areas in the game, such as inside a Player Owned House, also allow players to keep all of the items they are carrying should they happen to die. Now that you understand the concept of dying in the game, you can learn how to deter or prevent yourself from being killed. Spells, jewelry, prayers, and potions are all methods to decimate the chances of dying. Cure Other 68 Cures another player of poison. Cure Me 71 Cures yourself of poison. Cure Group 74 Cures a group of people of poison. Heal Other 92 Lets you heal another player. Heal Group 95 Lets you heal a group of people. Dream Spell 79 Speeds up your recovery by five times the default rate. Must be cast when not in combat. If you are disturbed when casting, you will stop dreaming and will have to recast the spell. Requires level 79 Magic. May only be cast by finishing the Dream Mentor quest. 1 These spells may only be performed if Members have finished the Lunar Diplomacy quest. Ring of Life If you are wearing this and your Life Points drop below 10%, it will teleport you to your spawn point. Note that it is still possible to die while using this, if you reach 0 Life Points without dropping below 10% first. It will turn into dust once the charge has been used up. Phoenix Necklace When the wearer's Life Points drop below 20% of their max Constitution, their Life Points will be restored to 30% of their max. It has a priority over the Ring of Life and will turn into dust after one use. Bracelet of Inoculation Protects against disease up to 250 damage. Bracelet of Regeneration Doubles your Life Points recovery rate and has no limit. Rapid Heal 22 Doubles the restore rate for Life Points. Protect From Magic 37 This will protect you from magical attacks. Protect From Missiles 40 This will protect you from ranged attacks. Protect From Melee 43 This will protect you from close melee attacks. Redemption1 49 If your Life Points drop below 10%, you'll be healed 250% of your maximum Prayer. Also, this drains all of your Prayer Points when used. Rapid Renewal 65 Restores your Life Points at 5x the default rate. Can only be obtained by purchasing it with Dungeoneering tokens. Once you have 107,000 tokens, you may purchase the Scroll of Renewal. Once the scroll is used, you permanently learn the prayer. 1 It is still possible to die while wearing this, if you reach 0 Life Points before dropping below 10% of your maximum Life Points. Guthix's Rest Tea 18 Cures some poison, restores Run Energy & boosts health by 50 if you have full health. Must have talked to Sanfew during the One Small Favour quest to be able to make this. Saradomin Brew 81 Increases your Defence by 20% and Constitution by 15%, but lowers your Strength, Magic, and Ranged by 10%. Sanfew Serum 65 Gives the effects of a Super Restore and an Anti-poison potion and will also cure disease. Can be used as a weapon against Nail Beasts. Relicym's Balm 8 Cures disease and can be used as a weapon against orange Broodo Victims. Hit splats are the measurement of damage your character receives or produces. When you attack someone in regular forms of combat, three types of hit splats may occur. Damage in combat is shown through your Life Points bar. It is a green bar that hovers over you and your opponent to show how much more damage each of you can take. The red shows sustained damage, the green shows the remaining life points. Usually accompanying a hit splat will be a small icon to the left. This resembles the type of hit in which the attack dealt damage with. Melee Hit This sword icon will accompany any type of successful melee attack. Ranged Hit This bow and arrow icon will accompany any type of successful ranged attack. Magic Hit This mage hat icon will accompany any type of successful magic attack. Dwarf Multi-Cannon Hit This Dwarf Cannon head icon will accompany any type of successful Dwarf Multi-Cannon hit. Deflected Damage This blue arrow icon will accompany any type of successful damage deflected whilst using the deflect prayers from the Ancient Curses spell book. Armour Soaking This shield icon presents a number alongside it to show how much damage your armor absorbed for you. This is a process called soaking. Now that we have discussed the types of hits, it's time to see the types of hit splats you may experience while playing the game. Defensive Hit This blue shield splat means that you or another personality successfully blocked the incoming attack. Damaging Hit This red splat appears once your player has successful dealt or has been given damage. Max Hit A max hit splat appears once you or an enemy applies their maximum amount of damage for their current level. Poison Hit The green splat means you have been poisoned. This is a condition in which Life Points will continually be taken from you until you either run out of Life Points, or heal yourself. Disease Hit The disease hit splat does not target your Life Points, it drains away levels from other skills instead. Healing Hit This purple hit splat indicates healing. It is shown in two quests, A Fairy Tale Part III: Battle at Orks Rift, and The Void Stares Back. It also is shown when healing during Dungeoneering. While in the midst of combat, or even whilst you are poisoned, there are several ways in which you can heal yourself to prolong or prevent death. The common method of healing in the realm of Gielinor is by eating food. View the list below to see the types of food you can eat, and how much they heal you. Some even boost other stats for you as well! Karambwan 180 You must have completed the Tai Bwo Wannai Trio quest to be able to cook this. Cook it for a long time. Pineapple Pizza 220 Two bites. Wild Pie 220 +5 Slayer and +4 Range. Two bites. Summer Pie 220 +5 Agility and +10% energy. Two bites. Strawberries 60 A basket can hold up to 5 Strawberries, and each one heals 60 Life Points when eaten making this the highest healing item(s) in RuneScape. Up to 5 bites (one per berry). Rocktail 230 It may give up to 100 Life Points to your total Life Points as a boost. These are just a few of the many foods that RuneScape is filled with. By becoming more acquainted to the game, you will discover even more foods that will stabilize your Life Points at a decent amount . Unfortunately, for every good thing, there must be an opposite. There are "bad" foods in RuneScape in which you should avoid. See the list below to see which foods you should avoid and why. Karambwan 0 You must have completed the Tai Bwo Wannai Trio quest to be able to cook this. If you cook this for a short time it will be poisonous. Nightshade 150 You must be wearing gloves when you pick it or you will be poisoned. Poison Chalice -490-320 May deal up to 490 damage, but may also heal up to 320 Life Points. It can also raise a random skill by one level. For anyone who completes the long and challenging road to level 99 Constitution, there is a reward; and bragging rights. Once you have achieved 99 Constitution, head on over to the Duel Arena. Once there, visit the hostpital and find Surgeon General Tafini to claim your Cape of Accomplishment for a fee of 99,000gp. With it comes a special emote! The description reads: "Your character is struck by an arrow as your clothes disappear. You are then struck by another arrow as your skin disappears, and then struck with a third arrow as your muscles disappear and your bones show. Your character then returns to normal, pulls all three arrows out of his body, and throws them away." If this is your first level 99 skill, you will receive a cape with no special trim. If you are a skill master in multiple skills, you will receive a cape with a red trim.